Hollywood Stars and Sports Heroes: Uncle Sam Wants You! Back in 2013, I wrote an article on U.S. wars and the absence of movie and sports stars in the ranks of those who serve. Hollywood and sports leagues such as the NFL and MLB celebrate the military today, but that celebration does not extend to service and sacrifice. Indeed, the main service is lip service: basically, cheap words to the effect that we celebrities “support” the troops. It’s not exactly the kind of service we associate with the Greatest Generation of World War II, is it? Yet the absence of Hollywood celebrities and sports “heroes” in the ranks may be indicative of another, much more serious, issue. Maybe America’s wars simply aren’t vital to them — or to us? And if they’re not vital, why are they still in progress? Why can’t we end them? The tradition of the citizen-soldier is still alive in this country — just look at our National Guard units. But the burden of military service is obviously not equally shared, with the affluent and famous tucked away safely at home. How many people remember that Jimmy Stewart, legendary Hollywood actor, flew dangerous combat missions in the skies over Europe during World War II? Stewart didn’t flaunt his combat service; in fact, playing against type, he stayed home as the unhallowed George Bailey in It’s A Wonderful Life, a movie that celebrated the heroism of the ordinary citizen. In the movie, Stewart’s quiet, home-based heroism, his powerful sense of fairness and decency, is even allowed to overshadow that of his younger brother, who returns from war with the Medal of Honor. Other than Pat Tillman, who gave up a promising NFL football career to join the military after 9/11, I can’t think of a single celebrity who answered the call to arms as a citizen-soldier. Then again, that call was never issued. After 9/11, President George W. Bush famously told us to keep calm and carry on — carrying on shopping and patronizing Disney, that is. He did so because he already had a large standing professional military he could call on, drawn primarily from the middling orders of society. This “all volunteer military” is often described (especially in advertisements by defense contractors) as a collection of “warfighters” and “warriors.” In the field, they are supplemented by privatized militaries provided by companies like Academi (formerly Blackwater/Xe), Triple Canopy, and DynCorp International. In a word, mercenaries. These bring with them a corporate, for-profit, mindset to America’s wars. If we as a country are going to keep fighting wars, we need a military drawn from the people. All the people. As a start, we need to draft young men (and women) from Hollywood, from the stage and screen. And we need to draft America’s sports stars (I shouldn’t think this would be an issue, since there are so many patriotic displays in favor of the troops at NFL stadiums and MLB parks). Jimmy Stewart served in combat. So too did Ted Williams. So too did so many of their Hollywood and sporting generation. Until today’s stars of stage and screen and sports join with the same sense of urgency as their counterparts of “The Greatest Generation,” I’ll remain deeply skeptical of all those Hollywood and sporting world patriotic displays of troop support. If this whole line of argument sounds crazy to you, I have a modest suggestion. Rather a plea. If our celebrities who profit the most from America are unwilling to defend it the way Stewart and Williams did, perhaps that’s not just a sign of societal rot. Perhaps it’s a sign that our wars are simply not vital to us. And if that’s the case, shouldn’t we end them? Now? “12 Strong” is set in the harrowing days following 9/11 when a U.S. Special Forces team, led by their new Captain, Mitch Nelson (Hemsworth), is chosen to be the first U.S. troops sent into Afghanistan for an extremely dangerous mission. There, in the rugged mountains, they must convince Northern Alliance General Dostum (Negahban) to join forces with them to fight their common adversary: the Taliban and their Al Qaeda allies. In addition to overcoming mutual distrust and a vast cultural divide, the Americans—accustomed to state-of-the-art warfare—must adopt the rudimentary tactics of the Afghani (sic) horse soldiers. But despite their uneasy bond, the new allies face overwhelming odds: outnumbered and outgunned by a ruthless enemy that does not take prisoners. I don’t think it will surprise anyone that, despite those “overwhelming odds” and being “outnumbered and outgunned by a ruthless enemy,” U.S. troops prevail. Watching the trailers on TV is a surreal experience. You get the impression the U.S. cavalry sounded the charge and won the Afghan war in 2001. You’d never know U.S. forces are still fighting in Afghanistan in 2018, facing a “stalemate” and a resurgent Taliban that controls vast swaths of territory, and that U.S. forces face a “generational” slog to an endpoint where victory is indeed ill-defined. Even though America is treading water in the Afghan war, Hollywood has cherry-picked an episode from the early days of that war, in the tradition of a John Wayne movie (like “The Horse Soldiers“). The Wild West has been reset to Afghanistan with U.S. troops as the new sheriff in town, with the Taliban serving as the “savages” in the old Western tradition. It’s the U.S. cavalry to the rescue, in the wild Afghan mountains. Yet highlighting this one episode in America’s quagmire war in Afghanistan is more than misleading. It’s as if the Japanese made a film about World War II that began and ended with Pearl Harbor. Remember when Candidate Trump boasted that, when he became president, Americans would win so much, we’d get bored with winning? “Believe me,” he said. Maybe this is believable … at the movies. Tom Engelhardt. Introduction by W.J. Astore. Colonel (retired) Andrew Bacevich has a new article at TomDispatch as well as a new book on America’s War for the Greater Middle East (my copy is already coming in the mail). Bacevich’s main point in his latest article couldn’t be more clear: Congressional cowardice. Congress refuses to exercise the people’s authority over presidential warmaking, a gross dereliction of duty that ensures perpetual wars with missions perennially left unaccomplished. And that is the theme of Tom Engelhardt’s introduction to Bacevich’s article. It was a large banner and its message was clear. 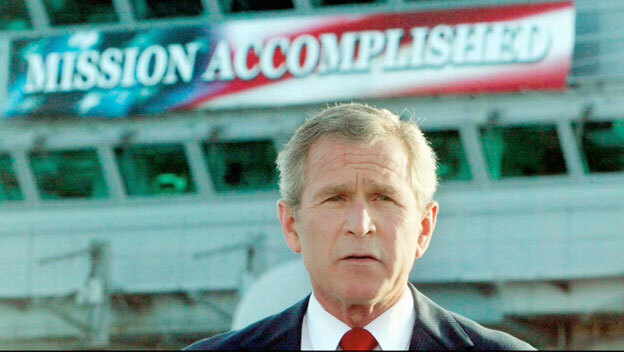 It read: “Mission Accomplished,” and no, I don’t mean the classic “mission accomplished” banner on the USS Abraham Lincoln under which, on May 1, 2003, President George W. Bush proudly proclaimed (to the derision of critics ever since) that “major combat operations in Iraq have ended.” I’m actually referring to a September 1982 banner with those same two words (and an added “farewell” below them) displayed on a landing craft picking up the last Marines sent ashore in Beirut, Lebanon, to be, as President Ronald Reagan put it when they arrived the previous August, “what Marines have been for more than 200 years — peace-makers.” Of course, when Bush co-piloted an S-3B Viking sub reconnaissance Naval jet onto the deck of the Abraham Lincoln and made his now-classic statement, major combat had barely begun in Iraq (and it has yet to end) — nor was it peace that came to Beirut in September 1982: infamously, the following year 241 Marines would die there in a single day, thanks to a suicide bomber. “Not for the last time,” writes Andrew Bacevich in his monumental new work, America’s War for the Greater Middle East: A Military History, “the claim proved to be illusory.” Indeed, one of the grim and eerie wonders of his book is the way in which just about every wrongheaded thing Washington did in that region in the 14-plus years since 9/11 had its surprising precursor in the two decades of American war there before the World Trade Center towers came down. U.S. military trainers and advisers, for example, failed (as they later would in Iraq and Afghanistan) to successfully build armies, starting with the Lebanese one; Bush’s “preventive war” had its predecessor in a Reagan directive called (ominously enough given what was to come) “combating terrorism”; Washington’s obsessive belief of recent years that problems in the region could be solved by what Andrew Cockburn has called the “kingpin strategy” — the urge to dismantle terror organizations by taking out their leadership via drones or special operations raids — had its precursor in “decapitation” operations against Muammar Gaddafi, Saddam Hussein, and Somali warlord Mohamed Farrah Aidid with similar resulting mayhem. The belief that “an additional increment of combat power might turn around a failing endeavor” — call it a “surge,” if you will — had its Iraq and Afghan pretrial run in Somalia in 1993. And above all, of course, there was Washington’s unquenchable post-1980 urge to intervene, military first, in a decisive way throughout the region, which, as Bacevich writes, only “produced conditions conducive to further violence and further disorder,” and if that isn’t the repetitive history of America’s failed post-2001 wars in a nutshell, what is? As it happened, the effects of such actions from 1980 on were felt not just in the Greater Middle East and Africa, but in the United States, too. There, as Bacevich writes today, war became a blank-check activity for a White House no longer either checked (in any sense) or balanced by Congress. Think of it as another sad tale of a surge (or do I mean a decapitation?) that went wrong. Posted on April 5, 2016 April 5, 2016 by wjastorePosted in US Military, US Politics, warTagged American culture, Andrew Bacevich, Congress, Hollywood, IMF, Mission Accomplished, War. Like so many bloated Hollywood movies nowadays, America’s wars may bomb, but they always produce their own sequels. Look at the latest news from Iraq and Afghanistan. These wars have persisted for more than a decade, with several re-releases to include “surges” and repeats. The latest from Iraq is preparations to retake the city of Mosul from ISIS, which promises a repeat of the level of destruction visited upon Fallujah in 2004. In this there are echoes of Vietnam: in Mosul, we may have to destroy the city to save it. Five Iraqi brigades, most likely supported by American airpower and some American troops on the ground (air controllers and Special Forces), are poised to strike as early as April. Doubtless they’ll prevail, at least for the moment, as the city and its civilians pay a price so dear as to be indistinguishable from defeat. Mosul will be “liberated,” but just look what happened to Fallujah, which after the American “victory” in 2004 is now a devastated city retaken by elements of al-Qaeda in 2014. In other words, expect more micro-surges of American troops and assets in the coming years, as well as more reports of “progress,” however temporary or illusory (at least America’s best and brightest learned from Vietnam not to talk of seeing light at the end of tunnels). 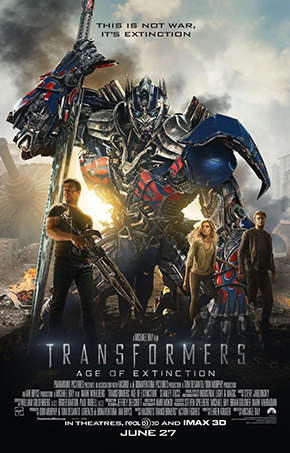 America’s wars are much like the “Transformers” franchise of movies: thrilling and seemingly conclusive at first, with much talk of missions being accomplished, followed by sequel after sequel of repetitive battles, increasingly loud and destructive, signifying vapidity and intellectual bankruptcy even as a few profit greatly from them. And no one (certainly none of the producers at the Pentagon) seems to be able to pull the plug on green-lighting ever more sequels to these wars. Even when they bomb. [Remington’s works] reminded [me] of something easily forgotten by the sanitized depictions of Indians inflicted on our own times. Remington was able to portray them as obviously aboriginal while preserving their stoicism and majesty. Hollywood Indians, whether in Kevin Costner’s wolf-waltzing epic or the Mohican picture featuring the terminally taciturn Daniel Day Lewis as foil for the grumpily taciturn Russell Means, are simply European ethnics festooned in feathers and possessed of nifty woodcraft. Remington’s Indians, though, are people so alien that one instantly recognizes them as part of another world uneasily coming to terms with an encroaching one. His “Apache Scouts, Listening” perfectly captures the odd division between the near-feral instincts of the scouts and the tentativeness of their army employers. 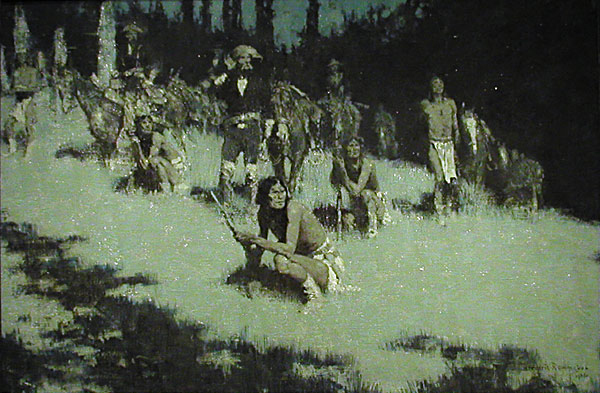 The several Apaches are in various postures, mainly ones of repose, but their necks are elongated, their broad faces frozen with concentration and all directed just beyond the viewer; the two army officers sit on horses in the background, their hands cupping their ears in an effort to hear that the Apaches obviously can detect with ease. It is night and winter, and a full moon illuminates the scene with jarring clarity, the light ambient from the heavy snow on the ground. I could still be standing there watching it if allowed to. Few Hollywood movies that I’ve seen capture the distinctiveness and uniqueness of Native Americans on their terms. Our movies are mitigated (or polluted) by the Western gaze, tending to portray Indians as either “savages” or mystical proto-environmentalists/Zen gurus. We see what we want to see, not what is. Back in the bad old days of John Wayne westerns, Indians were typically portrayed as savages who deserved to be extirpated or shunted on to reservations where they could be “civilized.” Nowadays, the “magical” Indian is more common, a noble brave and guru to the White man who highlights the White man’s materialism, prejudice, and violence. Although it’s not a perfect movie (it has its own political agenda), “Little Big Man” with Dustin Hoffman and Chief Dan George captures at least some of the distinctiveness of Indians, at least for me. The decision to allow the Indians to speak fluently in English (when it’s meant to be Cheyenne) helps to bridge the gap of understanding (no Pidgin English as in old westerns, and no distracting subtitles as in the sanctimonious “Dances with Wolves”). The depiction of Native Americans in LBM is neither universally positive nor negative. The brutality of Indians is shown in the opening scene of carnage in the aftermath of an attack on White settlers. The Cheyenne encampment is described in humorous terms (from my memory): “When first entering an Indian camp, one might be excused from thinking, I’ve seen the dump. Where’s the camp?” It’s an amusing reminder that standards of cleanliness for Plains Indians differed from White town folk. The Cheyenne also eat boiled dog, which the narrator (Hoffman) describes as downright delicate in taste (I doubt that scene would survive Humane Society inspection today). But for me the most harrowing scene is Chief Dan George’s masterful speech as he holds a scalp. He explains how the Indians (the “human beings”) believe everything is alive but the White man believes everything is dead. It captures the animism of the Indians and their connection to nature while highlighting the instrumentalism and ruthlessness of (some) Whites. The gulf in understanding between our peoples only exacerbated the wars over turf. And the Indians sensed, as Chief Dan George says in the movie, that they were on the losing side of the demographics (an endless supply of White men, but a limited number of Human Beings, notes Chief Dan George). But watch “Little Big Man” for yourself and draw your own conclusions. Even better, take a close look at Remington’s nocturnes. Try to place yourself in the paintings as my friend David Heidler so powerfully did. Such a vivid exercise in imaginative exploration — using Remington’s work as a time machine that transports you to a different world among a people who are far more diverse and complicated and alien than Hollywood has ever managed to capture — is both transfixing and transformative. And fun! Author’s note: I’d like to thank David Heidler for his permission to cite and share his personal (and moving) reaction to Remington. Posted on August 21, 2013 by wjastorePosted in SocietyTagged Apaches, Cheyenne, Chief Dan George, David Heidler, Frederic Remington, history, Hollywood, Indians, Little Big Man, Native Americans, Remington, time machine, westerns.